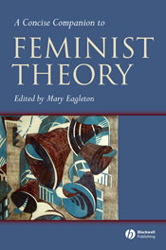 The Concise Companion to Feminist Theory introduces readers to the broad scope of feminist theory over the last 35 years. - Introduces readers to the broad scope of feminist theory over the past 35 years. - Guides students along the cutting edge of current feminist theory. - Suitable for students and scholars of all fields touched by feminist thought. Covers an exceptionally broad range of disciplines, discourses and feminist positions. - Organised around concepts rather than schools of feminism.